Learning the basics of accounting is an important step for every entrepreneur. This article describes the balance sheet and gives a example of filling one. Balance sheet is one of the most important terms in accounting. If you ever want to have your own company, you should learn about it. If you ever want to evaluate a company, you need to know how to read it. In any case this knowledge is important to anybody who wants to be an entrepreneur. In this post I am going to describe what is a balance sheet and I will give an example that explains how and when you make changes of the balance sheet. This post is for you if you are interested in general knowledge in accounting. If you are already familiar with even basic accounting, you would not learn anything new here. Moving out of the personal sphere, we are getting into the professional sphere. 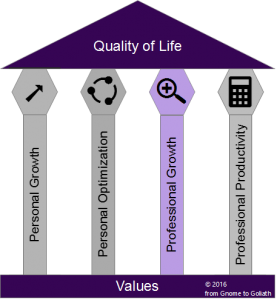 With personal growth and personal optimization you sow the field of success, and with professional growth and professional productivity you fertilize it. This means that you can get results by only mastering the first two pillars, but with the last two you can get results on steroids.